Remote codes for Proscan TVs. If you have recently bought a universal remote control and you need the remote codes to operate your Proscan TV, we have remote codes below for your TV that should be working. If the first does not work keep trying the numbers down the list. Do you have any other codes to add to the list for Proscan TV remote codes? Please leave a comment below. Just got a Proscan 55″ HD LED TV Model number PLDED 5515-C-UHD. Can’t find a code that will allow me to set up using my Telus Slimline Remote with the TV. Setup 991 then hit channel + till the TV shuts off , then hit setup . The process can take a few minutes but worked proscan 32 inch. What is code and directions for Proscan remote with Model number PLDED3273A-B? I have a 24″ proscan pledv2488a, have tried several codes, from 3 digit to 5. Nothing has worked. Trying to use my dish remote to control my volume. Help please. I have a Proscan TV with a built in DVD player. I need a code for an RCA universal remote. I can’t get my Comcast-Xfinity XR2 remote to program to the new Proscan PLDED5068A-D tv. Can anyone help? I have a ProScan Full HD 1080 PLED 2435A. It worked with an xfinity remote which has been locked into the tv. I recently ordered a proscan remote but it did not come with any codes. Someone told me that I would have to call xfinity to have them unlock the tv in order for me to use my new remote. I have no cable, just antenna, as I normally just like watching the news. 40 inch Proscan tv PLEDE3992A the only remote that worked for me is the Xfininty XR2 with the code 13332, volume, channel change and on/off functions all work! finally a code that works…thank you. I cannot get my MTS remote to work with my new 19 inch Proscan TV. I’ve tried many codes which I found on the internet. I’ve got a proscan 32″ tv model PLDED4273A-F and none of the codes that came with my universal remote work. The remote is an ONN from Walmart. I have a Universal remote RCR6473R to program my Proscan TV PLDED3273A-B. I HAVE TRIED ALL THREE METHODS AND IT STILL WILL NOT PROGRAM. WHY IS THIS HAPPENING JUST WITH THE PROSCAN TV? 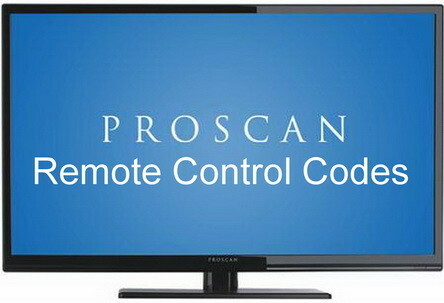 Which remote codes have you been trying with your Proscan TV? Do you have a problem programming the remote or with the remote codes not working? I have bought 14 universal remotes, NONE of them have been programmable to operate my Proscan TV, which is only a year old. RCA, ONN, LG, none of them will operate the TV. Any suggestions? Yes, use a universal remote control app on your iPhone or Android phone to control your ProScan TV.